The Vancouver Canucks announced today via their official website and social media outlets that General Manager Mike Gillis has agreed terms to a contract extension. Gillis joined the club in April 2008 and has led the Canucks to success ever since, most recently with two consecutive presidents’ trophy wins, with the grand prize of a Stanley Cup just one game away last season. Gillis told the press he was very pleased to be signing the new deal and that he was proud of the work the organisation had done in the past four years. The most uplifting part of the press conference for Canucks fans being the comment, “We are driven every day to try and win the Stanley Cup and will continue to focus on being a strong organization both on and off of the ice.”, a notion that may prove attractive to potential free agents looking for a change of scenery in the summer. Mike Gillis was a good hockey player in his own right, playing over 250 NHL Games for the Colorado Rockies and ironically the Boston Bruins during the late 1970’s and early 1980’s. After retiring from hockey as a player, Gillis became a successful player agent, representing the likes of Pavel Bure, Markus Naslund and Bobby Holik. His experience as a player agent proved an important factor when securing free agents and signing Canucks players such as Ryan Kesler and Kevin Bieksa to less-than-market-value ‘hometown discount’ contracts. A major part of his time as General Manager was the re-signing of the Sedin twins. Gillis flew to Sweden on June 30, 2009, just one day before the start of free agency and managed to convince both brothers to sign new $6.1 million contracts until the end of 2013/14, a steal for two players of their quality. What made this more sweet for the organisation was that the whole deal happened under the nose of Maple Leafs GM Brian Burke, who was already in Sweden and ready to move the twins to Toronto. While the announcement is great news for the Canucks organization and its fans, the talking point for the next few weeks will still be the future of head coach Alain Vigneault. 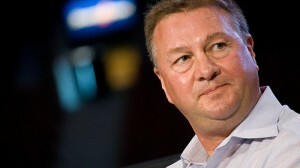 No information was provided by the Canucks on the future of the coach but speculation has suddenly turned from a very possible departure to the probability of another season at the helm for the Jack Adams trophy winning coach, with the Gillis and Vigneault tandem now expected to lead Vancouver to at least one more charge at the Cup in 2012/13.